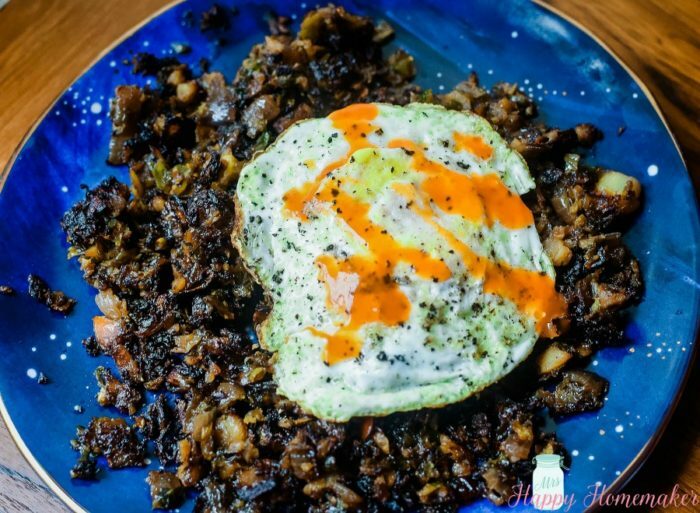 This Crispy Brussel Sprout Breakfast Hash is one of my favorite breakfasts. It’s so easy & delicious. Bonus points, it’s besties with the Whole30 & Paleo diet – but I eat it all the time! I love breakfast but don’t always eat it during breakfast hours. Sometimes I’m hungry in the mornings, but more times than not – I’m eating my ‘breakfast’ about 11am to noon (I get up about 5:30am each morning – even on the weekends. UGH. My body no longer lets me sleep in.). 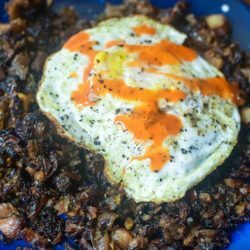 Sometimes I eat breakfast foods and sometimes I go straight for ‘lunch’ foods… and sometimes, I combine them together in a savory breakfast hash. And, I’m not talking about shredded hash browns (although those are good too) but instead a hash made of vegetables. 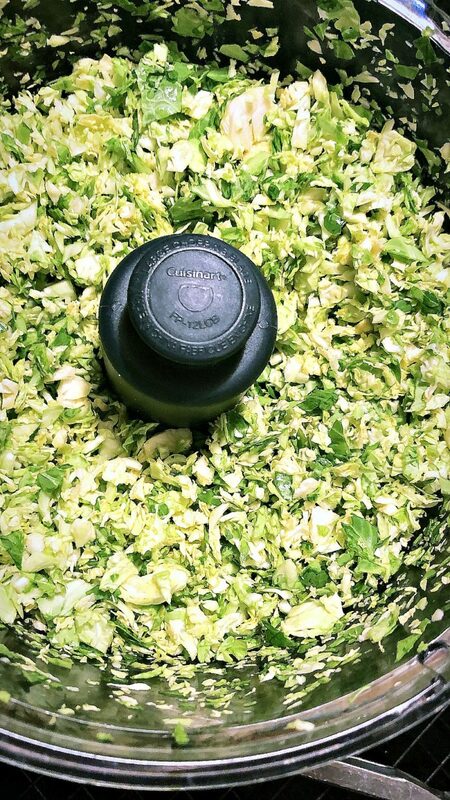 Sometimes I do a mix of diced potatoes with different vegetables cooked into it (my favorite recipe for that coming soon) and sometimes I do a Brussel sprout hash. I used to absolutely hate Brussel sprouts but now I absolutely love them. I’m still not a huge fan of them boiled but crispy brussel sprouts? Gimme! 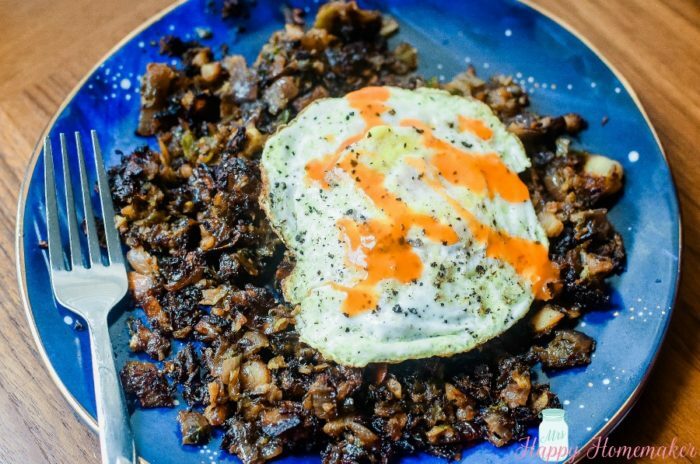 I love to oven roast them either whole or cut in half until the top leaves are nice and potato chip crispy (and then I proceed to stand beside the oven and eat all the crispiest of leaves off before serving them to my family) – but when I’m doing a breakfast hash, I especially love to shred my brussel sprouts. To shred them easily, just throw them into your food processor after you trim them. If you don’t have a food processor, you could also just chop them super small. When you shred them, you’re basically exposing every single leafy edge to a heat element which delivers crispy leaves throughout. CRISPY LEAVES THROUGHOUT. Y’all, this is like some sort of good for your vegetable crack to me. I gobble it down. But I try to even it out a little and and throw a couple eggs on top. I did a fried egg in the pictures because I thought it would look prettier, but if I’m being totally honest here, I do not like fried eggs. I do not like sunny side up eggs. I only like eggs that have been scrambled or deviled. But, you know – the whole food blogger thing… gotta have a pretty picture. But waste not – thankfully I have family members who do like fried eggs. For me though? Scrambled eggs atop my brussel sprout hash please. Heavy on the black pepper and pass the hot sauce. Bonus points – if you’re doing Whole30 or Paleo, this is going to be your new best breakfast friend because it’s totally compliant with both. In a large skillet over medium high heat, heat 1 tablespoon of the olive oil and/or bacon fat. Add the shredded brussel sprouts to the pan and cook, while stirring, for about 5 minutes. Stir in the chopped onion. Cook until the brussel sprouts are to the doneness level you like. I happen to like mine well done – nice and crispy. In the last minute of cooking, add the minced garlic. Season with salt and pepper. In a separate skillet over medium heat, cook your eggs. You can fry them or scramble them – your choice. Season the eggs to taste with salt and pepper & a drizzle of hot sauce. 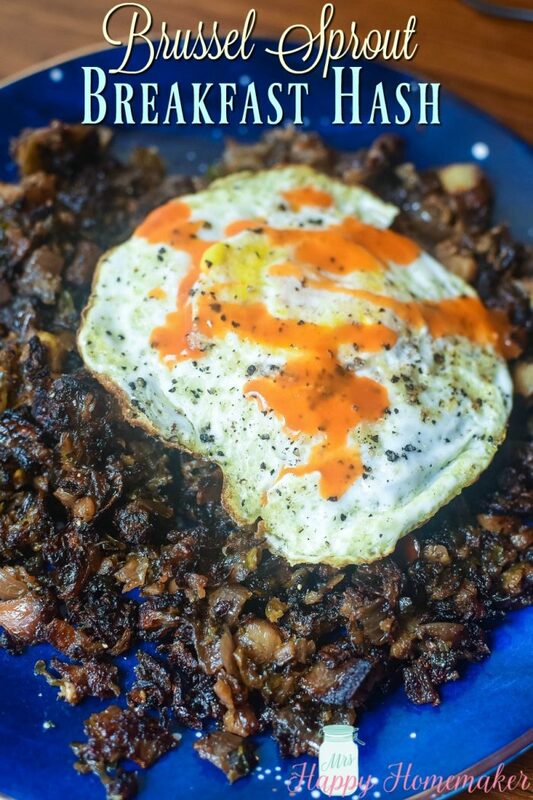 Top the brussel sprout hash with the eggs & serve.